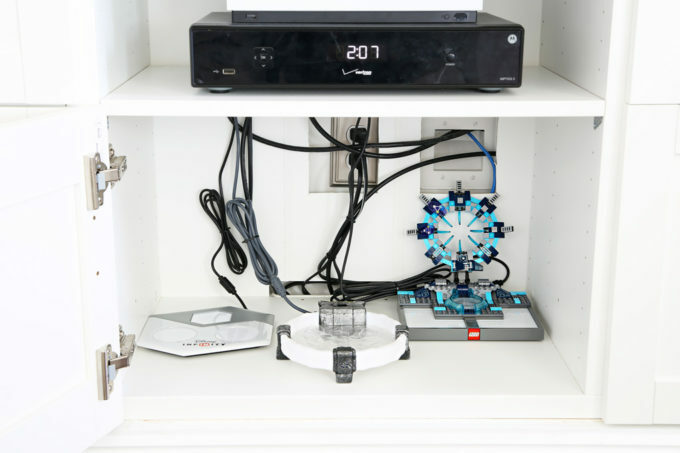 Organize DVDs and video games quickly and easily with these simple tips! These strategies will make it so much easier to find the movie or game you’re looking for! We’ve been working on some projects in our living room recently (Can you spot anything different in the photo below? 😉 ), so while we were at it, I figured I’d organize the DVDs, video games, and video game accessories that “live” in our entertainment unit. 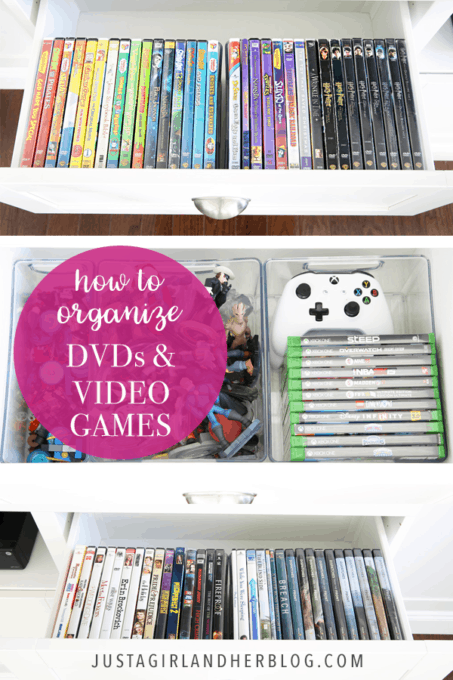 Like many other areas, I feel like the “best” way to organize DVDs and video games is largely dependent on the individual situation. 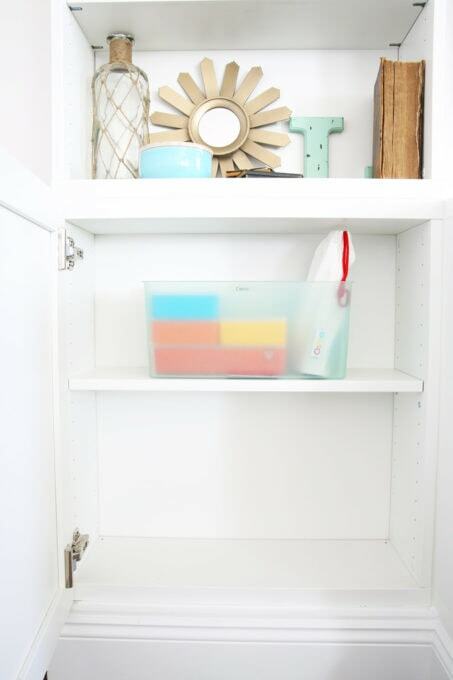 The number of items you have and the amount of space you have to store them will be deciding factors when it comes to finding the right storage system for you. We were never big DVD purchasers in the first place, and I just recently went through and got rid of a bunch of the ones we weren’t watching anymore, so we don’t have many. 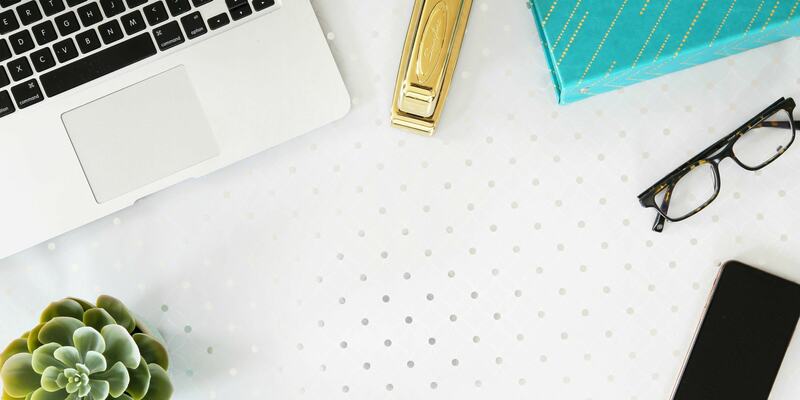 (That is always my first step in any organization project I take on– be ruthless and get rid of anything you’re not currently using or loving!) Plus, in the past few years if we’ve wanted to purchase a movie, we’ve been doing it digitally on Amazon, which means we probably won’t be adding to our physical DVD collection in the future. Because our collection is on the smaller side, I opted to leave our DVDs in their original cases and just use a few simple bins to corral them a bit better in the drawer so they don’t fall over. (These bins are the perfect size for holding DVD cases!) Leaving them in their cases allowed us to easily see all of the titles at the same time in one quick glance, and we weren’t hurting for space, so this method worked perfectly for us. 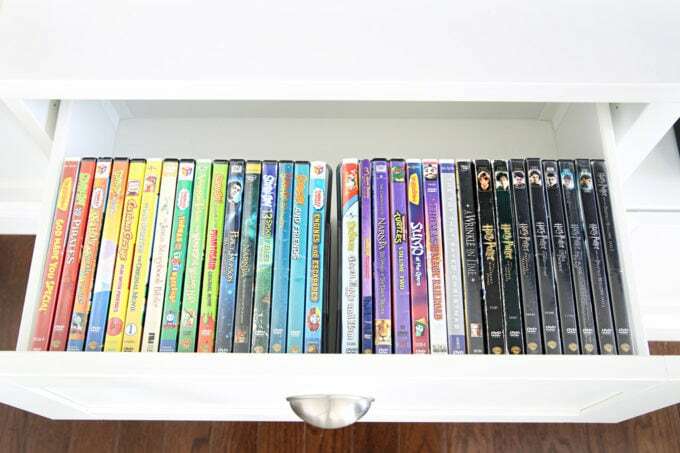 I put all of the kids’ DVDs in one drawer and used the same type of bins to hold the parents’ DVDs in another drawer. Can you tell I have a thing for chick flicks? Poor Donnie! If we had had a more extensive DVD collection or less room to store them (or both! 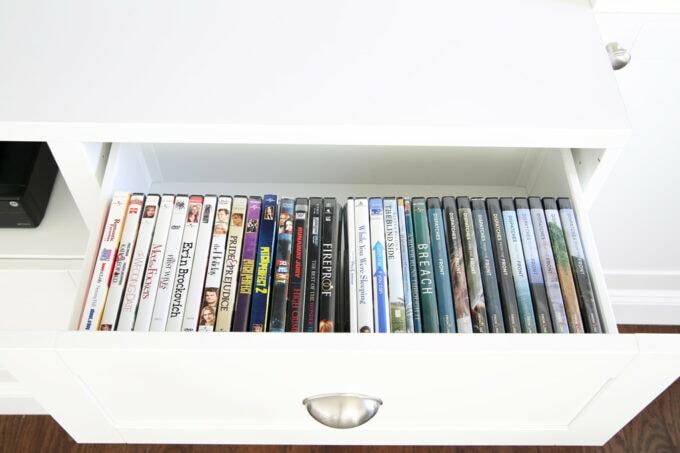 ), I might have gone with Erin’s method over at Sunny Side Up or Jen’s method at I Heart Organizing, both of which would allow you to store tons of DVDs in a much smaller space. If that is your situation, their posts are definitely worth checking out! We had three different types of “guys” that we were trying to organize: Skylanders, Disney Infinity, and LEGO Dimensions. 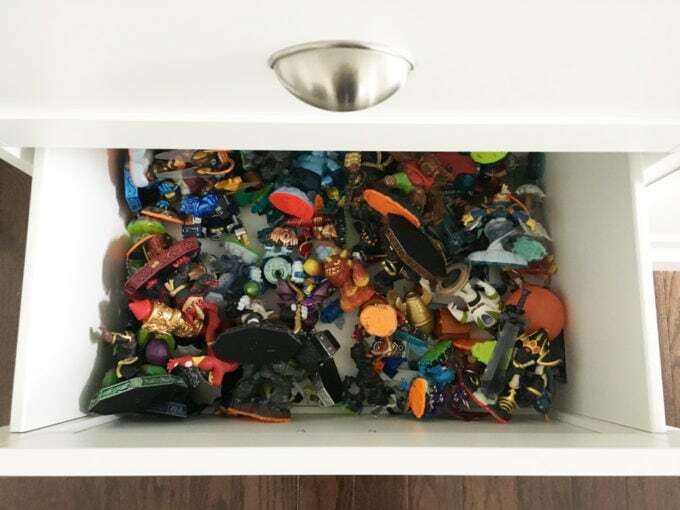 The LEGO and Disney Infinity collections were fairly easy because they were smaller and able to fit in one bin each. For the Disney Infinity characters, I was able to use the same size bin as I had for the DVDs. The LEGO pieces were able to fit into this narrower bin. …but I decided to add bins so that the boys could lift them out and more easily find the character they were looking for. 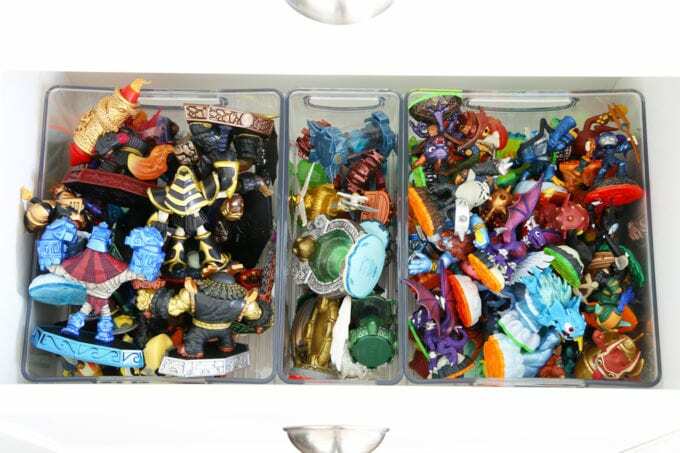 Caleb and I went back and forth over the best way to organize the Skylanders. At first he wanted to put them in six different categories and have a bunch of bins. 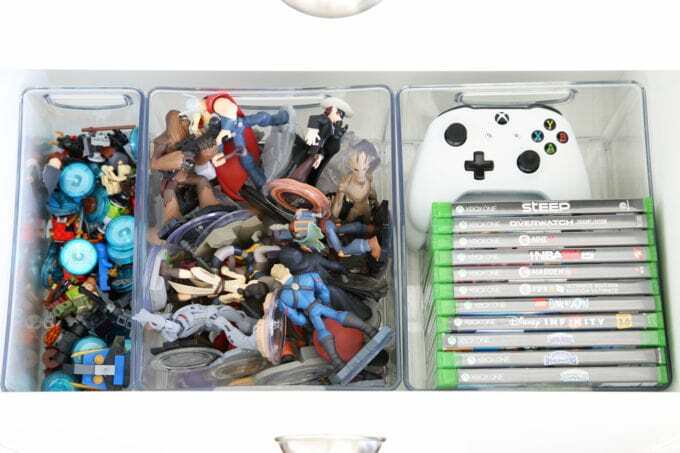 But when I reminded him that he would then have to maintain that system by putting each character back where it goes, he changed his mind, and we ended up mixing all of the “guys” together and only having a separate bin for the little gems and other accessories (which he INSISTED needed to be in the middle 🙂 ). This system will make it easier for the boys to find the character they want since they can lift out the clear bins and look through them, but it’s not overly complicated, so it will be easy to put everything back too! The portals had been in a mess of cords in the center cabinet of the entertainment center before, so I grabbed a few zip ties to try to corral them the best I could. The only other thing we store in the bottom part of the entertainment unit is all of the accessories for the boys’ Osmo games. 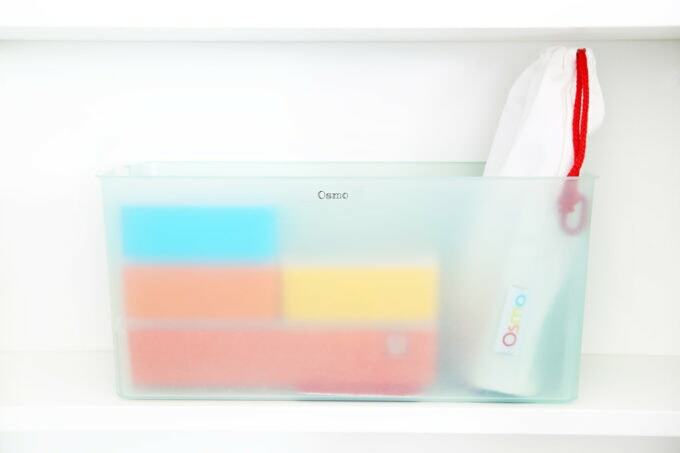 I used a bin we already had (It was from Target a few years ago, but I don’t see it on their site currently.) and put all of the Osmo pieces in it so the boys could grab it easily and play anywhere they wanted throughout the house. 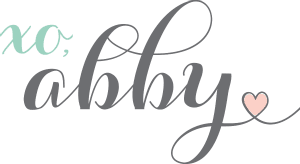 I used my favorite label maker to put a cute label on the bin in a fun font. And that’s about it for our organized DVDs and video games! 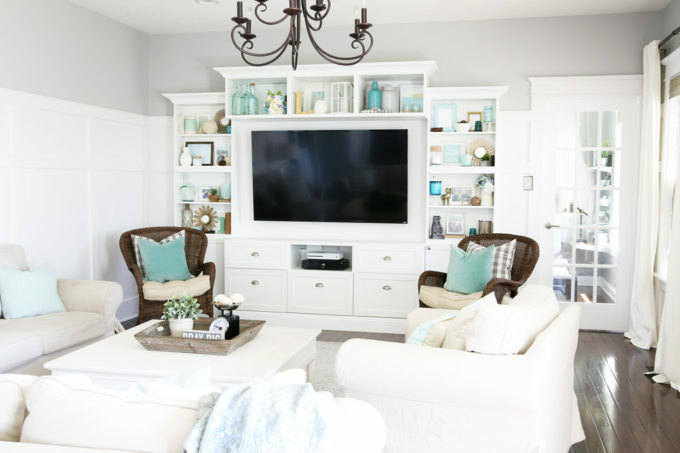 This was a pretty quick project, but it helped to streamline all of the items we needed to store in our living room and created a system that will allow us to keep things organized going forward. Wonderful system. Our plan is entirely different. But our children are grown now. So it works for us. Thanks for sharing though.